The conference will take place in the St. Wolfgang Federal Institute for Adult Education (BIfEB-Bundesinstitut für Erwachsenenbildung), which is located on the shores of the Wolfgang Lake in the heart of the Austrian alps, and is close to the picturesque town of Strobl. For more information visit their website. Although the institute belongs to St. Wolfgang, it is reached via the village Strobl. 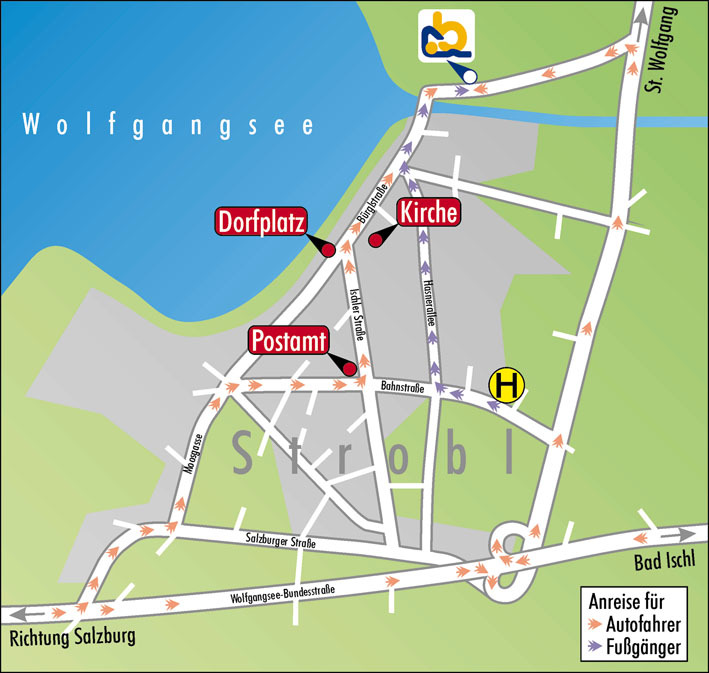 The centre of St. Wolfgang is much farther away from the institute than Strobl, so do not take the bus to St. Wolfgang but only to Strobl, if you go by bus. Once arrived in Strobl you will see signs leading you to the Bundesinstitut für Erwachsenenbildung. Below you find a detailed description of "How to get to Strobl" starting from several important destinations in Austria. Take the Salzburg City Bus Line 77 (Obus) to the central railway station Salzburg (last stop). From there take a bus to Strobl, as descriped below (central railway station Salzburg ). During hours of operation (6.30 am to 11 pm) the City Bus Line 77 departs every 15 minutes. The transfer takes approximately 20 minutes. The fee for one direction is 1,60 € (Euro). Take the Postbus Line Wien Westbahnhof (western railway station) to the western railway station (last stop). From there take a railway to the village Attnang-Puchheim as descriped below (western railway station). During hours of operation (5.30 am to 0.10 am) the bus departs every 30 minutes. The transfer takes approximately 35 minutes. The fee for one direction is 5,80 € (Euro). For more information look at the home page of the Vienna airport http://english.viennaairport.com/. Take any train with stop in the village Attnang-Puchheim. The trip takes approximately 2 hours 45 minutes. For the further journey see Railway station Attnang-Puchheim. Take any train with stop in the village Attnang-Puchheim. The trip takes approximately 55 minutes. For the further journey see Railway station Attnang-Puchheim. Take any train with stop in the village Bad Ischl. The trip takes approximately one hour. For the further journey see Railway station Bad Ischl. Remark: A table of times of departure you may find at the home page of the Austrian railway company http://www.oebb.at. In front of the central railway station Salzburg, across the street, you will find the central bus station Salzburg. There take the bus (Postbus) in direction Bad Ischl Bf. After a journey of approximately 1 hour 15 minutes leave the bus at the station Busbahnhof Strobl (bus station Strobl). The fee for one direction is 6 € (Euro). Times of departure for the bus Salzburg - Bad Ischl Bf see the timetable or better the web-page http://www.postbus.at. Close to the railway station in Bad Ischl you will find the main bus station of Bad Ischl. There take the bus (Postbus) in direction Salzburg. The bus departs After a journey of approximately 25 minutes leave the bus at the station Busbahnhof Strobl (bus station Strobl). The fee for one direction is 2.30 € (Euro). Times of departure for the bus Bad Ischl Bf - Salzburg see the timetable or better the web-page http://www.postbus.at. Reach the freeway A1 Salzburg-Linz-Wien. Take on the A1 the Exit Thalgau. Follow the motorway B 158 in directions St. Gilgen, Bad Ischl. Take either the exit to Strobl or the exit to St. Wolfgang. From here on follow the green signs BIFEB to reach your destination or have a look at the local map of Strobl. Follow the motorway B 145 in directions Gmunden, Bad Ischl. Before Bad Ischl change to the motorway B 158 in direction St. Wolfgang, St. Gilgen, Salzburg. Remark: For a more detailed description have a look at the route planner. Remark: In Austria at almost all public means of transport like bus, train, taxi, ... you have to pay cash and in EURO! Other currencies are not accepted! By car: Follow the orange signs. By foot: Follow the violet signs. The walking distance is approximately 1 kilometer.